This okra salad is so simple, it doesn’t even count as a recipe. I wanted to use up the handful of okra we got from our CSA box last week and I didn’t want to do a whole lot of cooking. For breakfast, I washed the okra, dropped it into a pan of water, brought it up to a boil, and let it boil for 1-2 minutes. 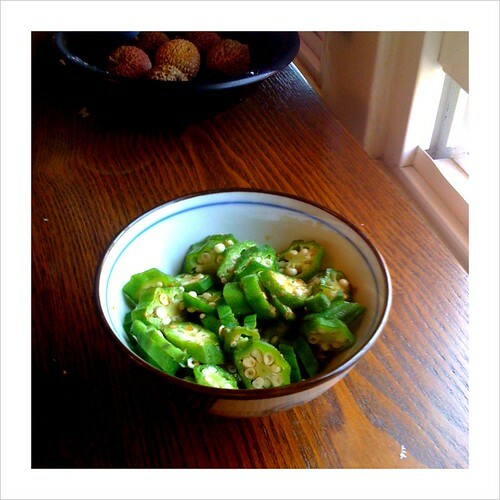 Then I rinsed and drained the okra in cold water and cut it into rough 1/4 inch slices. I ran out of ponzu, so I just made my own with some rice vinegar, bottled yuzu juice, and splash of soy sauce. To give the dressing a little more of a kick, I mixed in a small dab of yuzu kusho (pepper paste). I poured the dressing onto the chopped okra, gave it a little toss and that was it. The yuzu flavor really gave the okra a citrusy, refreshing taste without masking the sweet flavor of the fresh okra.